The next upcoming Ganesh Chaturthi is on Sunday September 1st, 2019. Ganesh Chaturthi or Vinayaka Chaturthi is the Hindu celebration of the birth of Lord Ganesh. His life represents prosperity, wisdom, and good fortune. The festival falls in August/September which is in the month of Bhadra on Shukla Chaturthi in the Hindu calendar. The festival is surrounded with great devotion and enthusiasm. Idols of Lord Ganesh are brought into homes for worship. The festival may last 1-11 days depending on location and tradition. 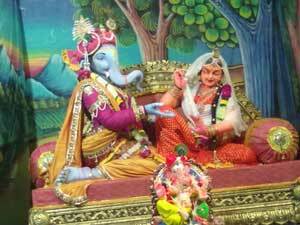 Lord Ganesh was born of Lord Shiva and Goddess Parvati. He is an elephant-headed man who is considered as one who grants intelligence and one who removes obstacles.